I got this recipe from http://www.aimeesadventures.com/. She has a lot of healthy recipes on her website that I want to try. She has a food journal, weight loss tips, a link to restaurant nutritional info, and other interesting info on her website so you should definitely check her out. You can also order one of her cookbooks with a collection of tried and true recipes if you do not feel like printing each individual recipe. This was the first recipe I tried from her site and it turned out pretty good. It was kind of soupy, had a little bit of kick (because I put the full 1 teaspoon of crushed red pepper), but it did need salt. The original recipe called for 2 pouches of Boca Crumbles, but I just used lean ground turkey. It would be nice served with a crusty piece of bread on the side. I would definitely call it comfort food for a cold or chilly day and it is only 3 points per serving. Not bad at all. In a large pot, brown turkey and onion; drain off fat. Add remaining ingredients except cabbage; mix well. 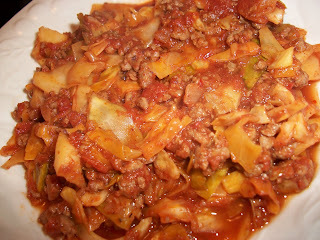 Stir in cabbage and simmer 15-20 minutes or until cabbage is tender.